Whereas not every office worker has access to a height adjustable desk or a 3D swivel office chair, every office worker has numerous options to incorporate regular movement and changes of body position into their working day: walking to a colleague rather than telephoning/skyping, placing folders and files out of arms reach so that you have to move to get them, holding meetings standing rather than sitting, being amongst the simplest solutions. That many don’t is pure bad habit. But the options are there. There are however those professions where such options aren’t there, where sitting is the only option, and of which the professional orchestra musician is arguably the best example: quite aside from regular, and often long, concerts and performances, there is the hours of rehearsals. Yet despite the fact orchestra musicians spend, more or less, their entire professional lives seated, not only is the seated musician a much less researched subject than the seated office worker, but the musician’s chair an object of much less design interest than the office chair. Or even the dining chair. In the contemporary orchestra aside from the percussionists, and arguably the perching double bassists, all instruments are played seated. And that rarely in manners conducive to good health: the nature and demands of the profession meaning that musicians are susceptible to a wide range of, potentially career threatening, physical and psychological conditions. A particular problem is musculoskeletal conditions associated with both the repetitive actions involved with playing many instruments and the less than optimal postures demanded, specifically in context of instruments played in so-called asymmetric positions, for example with raised arms. Among other surveys Leaver et al1 noted in 2011 that over half of respondents from 6 British orchestras had experienced lower back, neck or shoulder pain in the previous 12 months, in 2015 Steinmetz et al2 found a similar situation amongst professional orchestra musicians in Germany, while a 2009 study of Swedish music teachers by Edling and Fjellman-Wiklund3 concluded that those with asymmetric playing positions reported significantly higher levels of neck, shoulder and back disorders than their colleagues with symmetric playing positions. Research on causal factors of musicians’ muscular complaints tend to focus on measuring the significance of variables such as age, gender, length of career, instrument type, diet or somatisation, the transfer of psychological stress into physical discomfort. The chair all musicians sit on rarely coming under investigation. Yet when it does the results can be very illuminating. 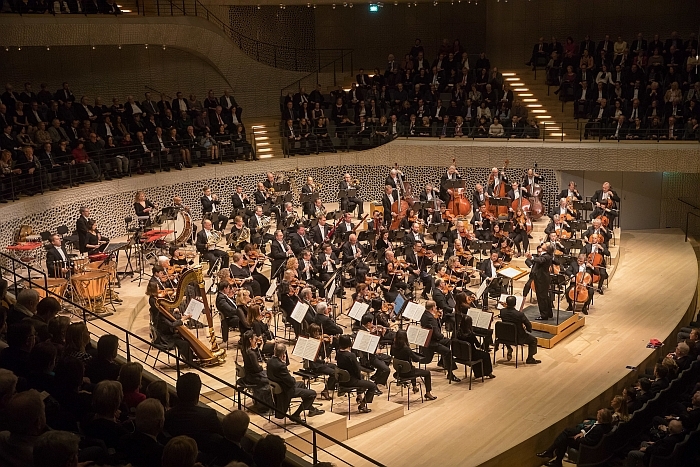 The first, and, and as far as we can ascertain, for many years the only study of orchestra musicians to consider the chair, was published in 1986 by a team from the Institut für Arbeitsmedizin at the Freie Universität Berlin (Schäcke et al)4. Based on a survey of 109 members of an otherwise unnamed opera orchestra, Schäcke et al reported that 51.4% were unhappy with their chair, specifically with the backrest, upholstery, seat height and seat angle. Noting that as members of the “homo sedens” musicians had no choice but to sit, and that in ways defined by their instruments, Schäcke et al put the emphasis for maintaining musician’s musculoskeletal health on their chairs and concluded that orchestra seating must take account of the postures of the different instrument groups and that anthropometric studies should be undertaken in order to generate precise information on the requirements for chairs relative to the different instrument groups. As far as we are aware, in the intervening 31 years, none has been published. 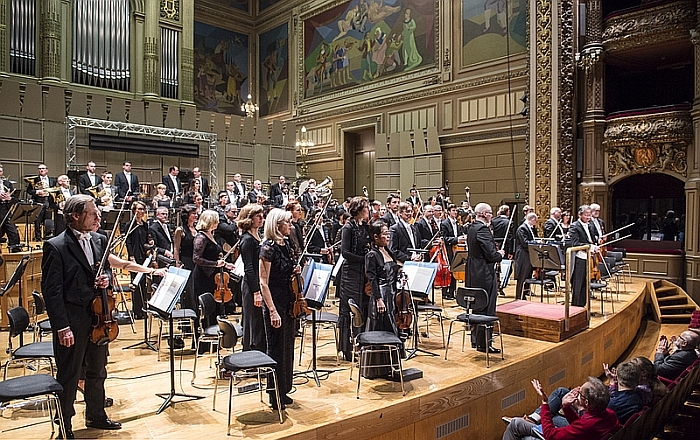 In a 2004 study of the Ljubljana based Slovene Philharmonic Orchestra Rajko Črnivec found that from the 70 musicians questioned 42% were dissatisfied with their chair, 14.5% dissatisfied with the height and 31.9% with the back support5. The greatest dissatisfaction was reported by double bassists, harpists, cellists, drummers, violinists and violists. Sadly despite having a control group of marketing workers based in a conventional office environment, he doesn’t record levels of dissatisfaction with their chairs: does however note that the rate of musculoskeletal problems amongst the musicians was six times higher than the control group. A direct relationship between sitting and the prevalence of muscular problems wasn’t made, Črnivec does however recommend the provision of ergonomic, height adjustable chairs with back support, specifically he suggests chairs labelled with the musician’s name. A personal chair much as in an office environment. In 2015 a team from the Ergonomics Research Centre at the University of Guadalajara (Leon et al)6 published the results of a study undertaken amongst the youth bands of Zapopan and Guadalajara. The sample size was 55 and found that whereas only 15.4% used a height adjustable bench, 71.4% considered “comfortable chairs or benches” desirable. There is sadly no definition of what “comfortable” means. And, theoretically, who doesn’t want a “comfortable” chair? Despite the relatively small number of studies – the above three are the only published research we can find – and relatively small sample sizes, one could argue that musicians are aware that their chairs aren’t exactly optimal. The question is, can design help improve the situation? The only published design led study looking at the subject of the musician’s chair we are aware of was undertaken by the architect and designer David A. Brothers from the New Jersey Institute of Technology7, and is based on interviews with 40 professional musicians combined with a year long observation of orchestra and ensemble musicians both performing and rehearsing. Which naturally got us thinking about how many office workers are concerned with the aesthetic subtleties of their chairs? We don’t think anyone has ever asked……. Trying to reason why musicians should be so ambivalent about the formal character of their chairs we initially, tried, considering aesthetics in music versus aesthetics in visual arts, before deciding it may simply be that because they rarely receive advice on how to sit, that many accept aches and pains as part of the job10, and that, as touring musicians, more often than not simply have to use that chair which is provided by a venue, regardless of how unsuitable, many musicians may learn to understand chairs as a neutral part of the “kit”, to make do, and thus give it no consideration. Much as there is no one perfect office chair, there can be no perfect orchestra chair, too varied are musicians and their preferences; however, David A. 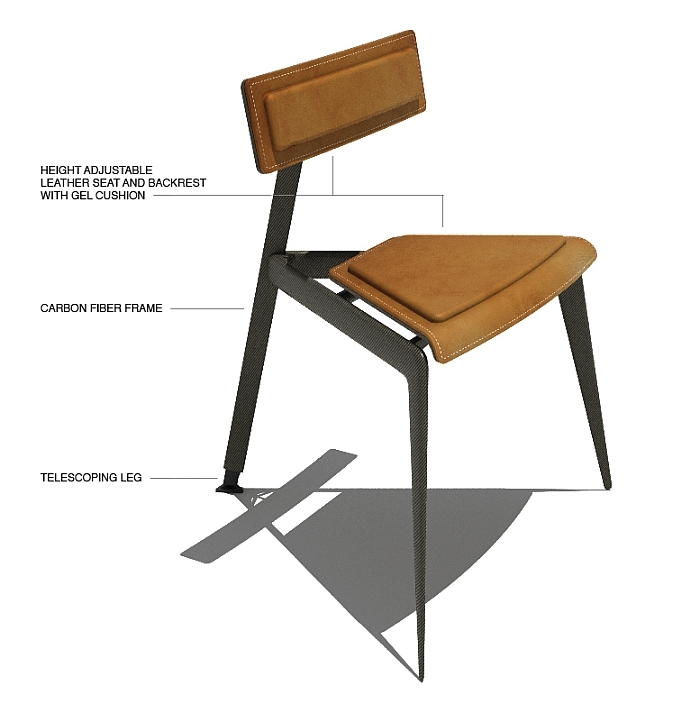 Brothers proposes that there are four key design factors to optimising the ergonomics of the musician’s chair: forward sloping seat, height adjustability, provision of backrests and that the chair allows for uninhibited freedom of movement. While not surprising conclusions, in many respects they mirror the findings of Schäcke et al, the fact that not all orchestra chairs provide such, is surprising. Imagine that in an office environment. Blocks under your chair legs to achieve an agreeable sitting position. A ridiculous state of affairs! 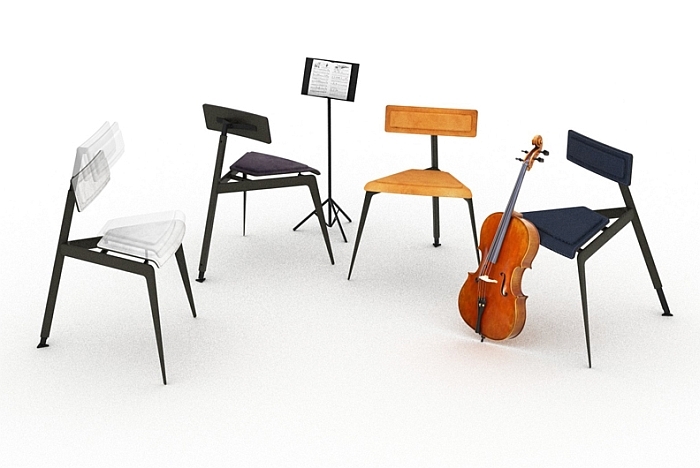 Taking up the challenge to create that “more” Wilde+Spieth have progressively developed a range of chairs for differing instruments and playing positions, and featuring a mix of height adjustment and tilting mechanisms. 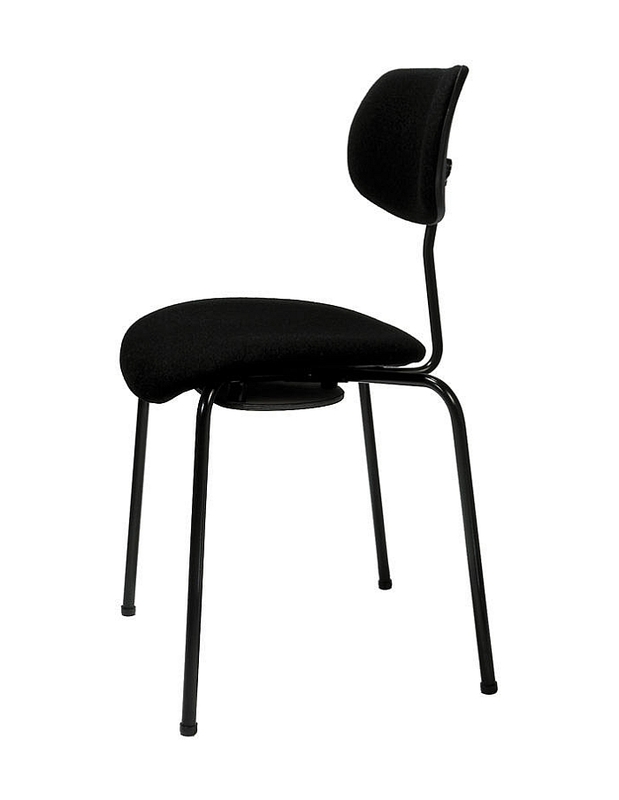 Chairs initially developed in cooperation with Egon Eiermann, subsequently independently of Eiermann, but always in cooperation with musicians. And chairs which not only reflect the four design factors identified by David A. Brothers, but also musicians’ general lack of interest in visual aesthetics. Aside from the non-adjustable version based on, and, more or less, formally true, to Eiermann’s SE 68, in the Wild+Spieth chairs functionality takes priority over proportion or purity of line. The functionality is however present, unlike many musician’s chairs which lack functionality and form. As a designer David A. Brothers is interested in visual aesthetics; consequently, from his research he developed a chair concept which in addition to the purely functional aspects also considers the form. As ever we never feel comfortable commenting on a chair we’ve never physically seen and had a chance to assess first hand; however, from what we’ve seen the triangular, carbon fibre, frame of David’s design creates a very reduced, unobtrusive object, whereby, we presume, the carbon fibre allows for the required stability with a lot less material than would normally be the case. 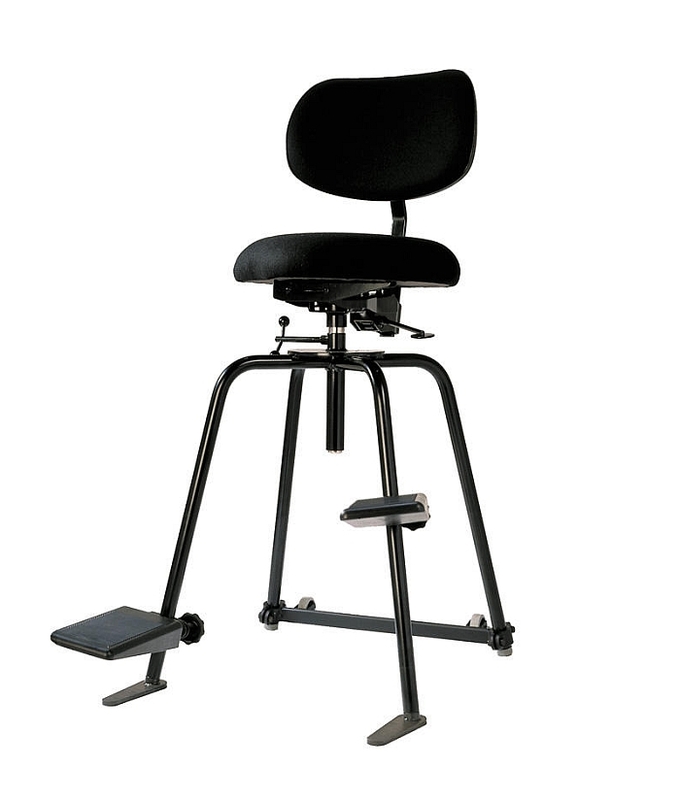 Cutting a very clean, elegant, self-confident figure, the seat and backrest are height adjustable, the backrest in addition can be moved forward if required, while forward tilt of up to 10° is achieved through a telescopic rear leg, a very popular mechanism for achieving height adjustment in orchestra chairs. If in no other chair types. Save collapsible angling chairs intended for uneven riverbanks and lakesides. Representing for us a welcome aesthetic improvement on what is currently available, the principle weakness is the non-stackability, an absolute key issue in the daily life of such an object. According to David this initial version was about exploring the basics of the idea through a chair intended for small scale use, for example by a quartet, a stackable version suitable for the demands of an orchestra is in development12, and we’re certainly looking forward to following how the project develops: not least because a visually pleasing, functionally responsive, chair may encourage musicians to take more interest in their chairs – or as Mark Braun opined in our recent interview, “I believe that through a good aesthetic functionality becomes longer lasting, that formal beauty creates an appreciation … when something is not only practical, but aesthetically pleasing, then you value it more and get a lot more pleasure from it“. And if more musicians value their chairs more, then maybe they will also take more interest in how their chairs can, potentially, help them maintain not only better posture, but better health. 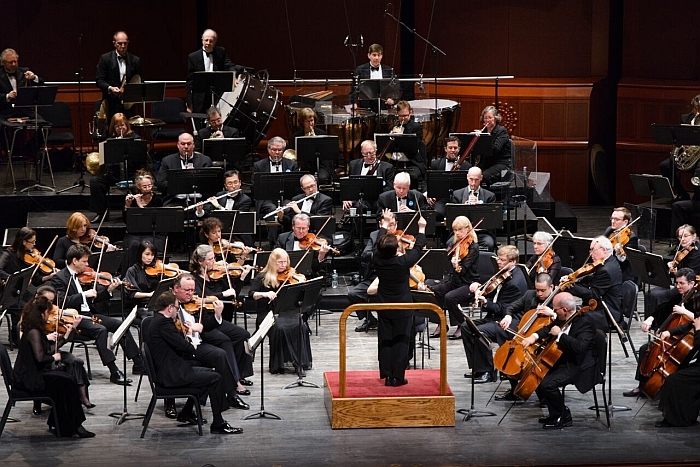 An orchestra chair is a work chair just as much as an office chair is a work chair: albeit with a few very particular peculiarities. Quite aside from the nature of the work undertaken in it, comes the fact that, much like hotel function and conference chairs, orchestra chairs are continually being moved, arranged, rearranged and stored in response to the concert hall’s programme: facility management factors which can outweigh ergonomic considerations when deciding which chairs to purchase. Even if they shouldn’t. 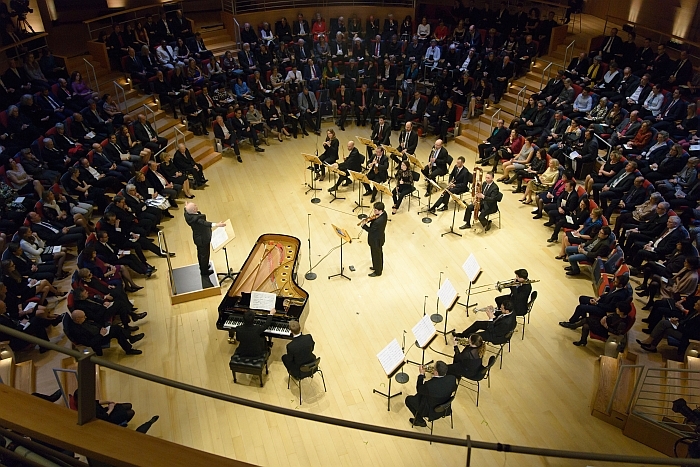 Further, in addition to emitting no noise themselves, orchestra chairs should not adversely affect the acoustics of the hall nor should they impact on the visual impression, should remain as anonymous as possible, must be supremely stable so as not to distract the musician with unexpected movement, and must be priced to meet concert hall, opera and orchestra budgets. A combination of factors which, in many respects, makes orchestra chairs a lot more challenging than office chairs. And so perhaps the greatest peculiarity of the orchestra chair is that it is of so little interest to designers. Or maybe designers don’t know orchestras exist, maybe they are all just far too busy rockin’…..
4. Schäcke G, et al: Muskel-Skelet-Bechwerden bei Orchester-musikern. Fortschritte Med 1986;6:126-128. 10. see, e.g. Ioannou C. & Altenmüller E., Approaches to and Treatment Strategies for Playing-Related Pain Problems Among Czech Instrumental Music Students. An Epidemiological Study, Medical Problems of Performing Artists2015;30:135-142 or Kreutz G. et al, Music Students’ Health Problems and Health-promoting Behaviours, Medical Problems of Performing Artists 2008;23:3–11.